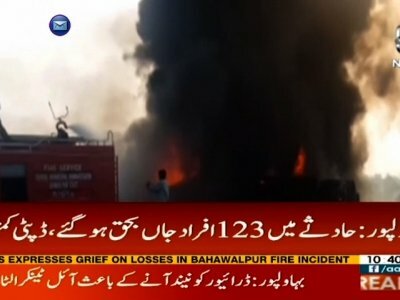 BAHAWALPUR, Pakistan (AP) — Alerted by an announcement over a mosque’s loudspeaker that an overturned tanker truck had sprung a leak, scores of villagers raced to the scene with fuel containers Sunday to gather the oil. Then the wreck exploded, engulfing people in flames as they screamed in terror. “I have never seen anything like it in my life. Victims trapped in the fireball. They were screaming for help,” said Abdul Malik, a police officer who was among the first to arrive on the scene of horror in Pakistan’s Punjab province. “Someone should tell me about my beloved sons. Where are they? Are they alive or are they no longer in this world? Please tell me,” she pleaded. Highway police moved quickly to redirect traffic but couldn’t stop the scores of villagers, spokesman Imran Shah told a local TV channel. “I could hear people screaming, but I couldn’t get to them,” he said. Dr. Javed Iqbal at Bahawalpur’s Victoria Hospital said most of the patients suffered burns to upward of 80 percent of their bodies. Many were evacuated by plane or helicopter to hospitals in the Punjab cities of Lahore and Multan.